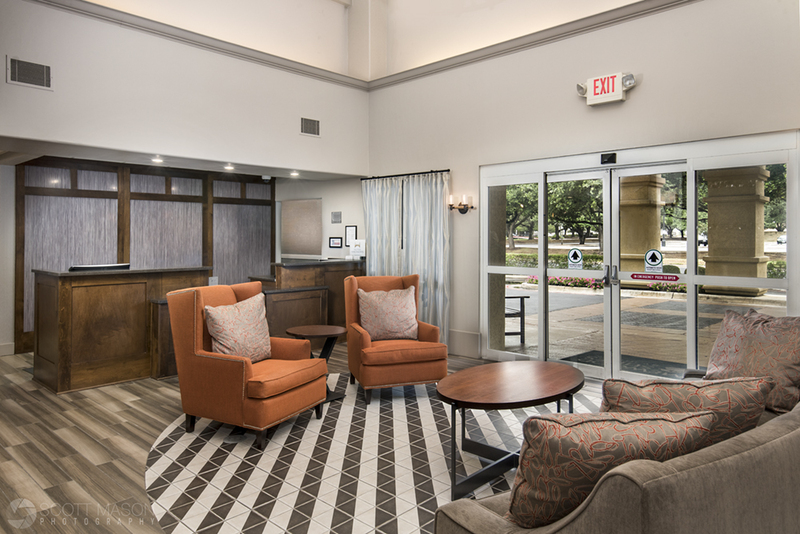 Last week I was given the opportunity to photograph a newly renovated Austin Hotel, the owned by Hilton. First, a little back story..
Over a year ago I participated in Expedia’s Austin Market Expo, in which I provided event photography as well as set up a booth to promote my photography service. I collected a roster of email contacts from the hotel industry, and promptly learned a most valuable lesson – follow up quickly or risk new connections forgetting you. Luckily one of these connections didn’t forget me, despite my lack of networking follow-through immediately after the event. 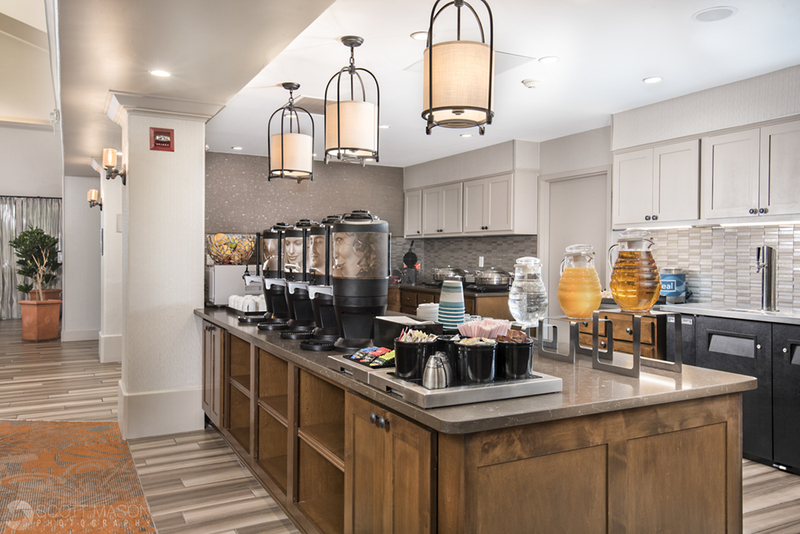 I was able to keep in touch with her via my email newsletter, and she came back to me over 18 months later with great news – her hotel Homewood Suites by Hilton at the Austin airport was all finished and finally had the final touches (“We have curtains! !” the email subject line exclaimed). At the time I’m writing this the images on the Hilton’s site aren’t mine, however they will be soon. We set up a date as quickly as possible I was able to finally get in there to photograph the interiors. We started with one of the suites, and the instruction given by the client was to show both rooms – both the living room and the bedroom in one image. I crammed myself in the corner and got to work! Looks inviting, does it not? Next I covered the breakfast area. The client wanted me to show a couple of different angles of this area. Even though this angle doesn’t show what’s happening inside of the breakfast area, I still like it the most. It’s visually “busy”, but in a good way – your eyes move about through the image due to the dynamic composition. This next one I threw in for fun, as I knew I would have a while until the lobby cleared out for me to photograph it. 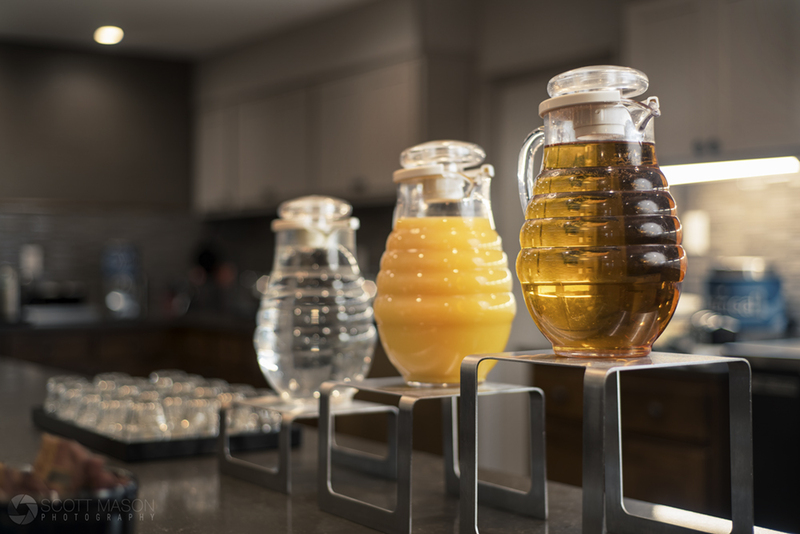 While it looks more like an advert for apple juice than a showcase of a local hotel’s amenities, I think surprising a potential hotel customer with this image in a slideshow could have a positive effect. That honey looks good enough to drink – wait – is that honey or juice?! On to the lobby, where I patiently waited for customers to clear out. As pleased as I am with this image, in hindsight I wish I would have added a clerk behind the desk to make it look a bit more welcoming. I would have had him/her walk by and blur their features, to avoid any potential privacy conflicts. The lobby – welcome home! The last image I’d like to share with you is a simple one, but it serves as a reminder that there’s nothing wrong with simple. Wrinkles were smoothed as much as possible, but natural and flash lighting revealed many creases and wrinkles that my eyes were not able to detect. Nothing some finesse in Photoshop couldn’t fix. This client is worth it – in fact every client is worth it. Simple, and that’s why I like it. 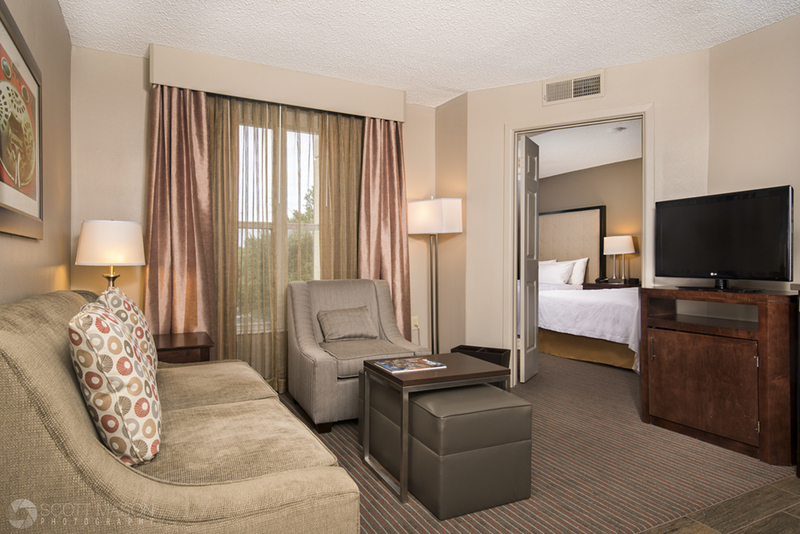 Thank you for your interest in this recent photo shoot of the Homewood Suites in South Austin. 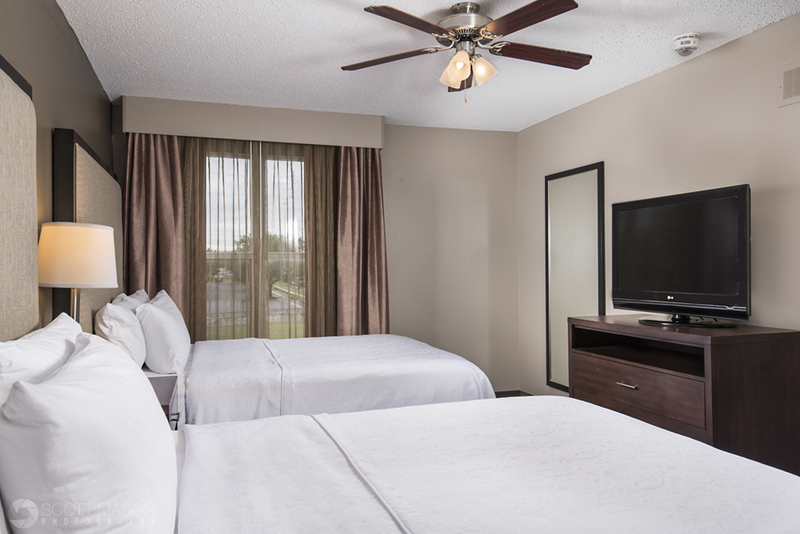 If you’re interested in updated photographs of your hotel, click here and reach out today for a quote on services.